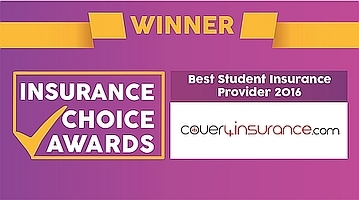 Hello , we’re delighted to announce that we’ve been awarded ‘Best Student Insurance Provider’ in the 2016 Insurance Choice Awards. We'd like to say a big THANK YOU to all of our customers who voted for us! We've had some great responses and feedback from you. We're delighted that so many of our customers are happy with our service. The Insurance Choice Awards have been launched to help consumers find the best insurance companies on the market. These are the only insurance awards in the UK decided by YOU, real customers, and not ‘industry experts’, so only YOU can decide who wins. If you sign in/sign up and leave a review of our service and product for 2018, you will be entered for the draw for a £1,000, voting ends 04/10/2018.